Thanks, Mr. T. It has indeed changed a lot, hasn’t it! A beautiful view of restaurants and inns along the Kamogawa (Kamo River) in Kyoto. This photo was most probably taken from Sanjo Ohashi. The bridge in the back is probably Nijo-hashi. Kamogawa was extremely important to the inhabitants of Kyoto as can be seen from the many stairs on the riverbanks which offered easy access to the river. Besides being a crucial source of drinking water, the river brought much needed relief during the hot summer months. The wooden poles seen along the riverbank were used for building terraces called Noryo Yuka above the river. During the summer, guests were entertained here instead of inside where it was warm and humid. This still happens today from May 1st through September 30th. Terraces were also made below the bridges, but that custom has long since vanished. In the middle of the river a person is standing on a dry area. These areas were used for drying dyed fabrics (京友禅, Kyoyuzen) in the sun after cleaning them in the river. The custom was abolished in the late 1970s due to pollution concerns. 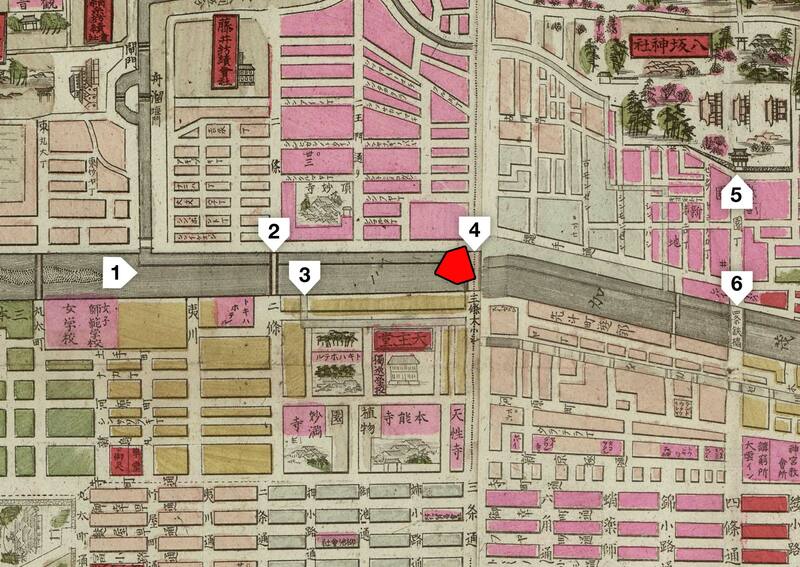 Because its erratic behavior made the river difficult to use for transport, the prominent Kyoto merchant Suminokura Ryoi (角倉了以, 1554-1614) decided to build a canal. The 10.5 km canal was opened in 1611. It would eventually be called Takasegawa (Takase River) after the Takasebune (高瀬舟, shallow-draft boat) that were used to transport goods. 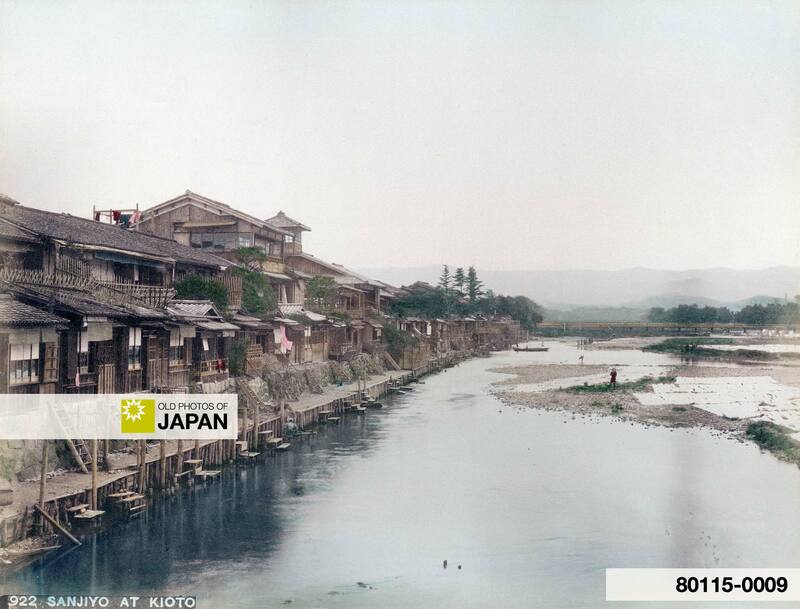 The canal received its water from the Kamogawa; the boat in this image is probably very close to the canal’s entrance. Takasegawa ran from Nijo to the Yodogawa in Fushimi/Chushojima. Through the early 1900s, it was an important trade route for transporting goods like rice, charcoal, salt and especially wood. Logs were drifted down the Hozugawa and were then moved to the head of the canal via Marutamachi (literally “log town”). Here they were turned into lumber before being shipped on to Osaka. The canal was also used to transport convicted criminals banished to live on a far-away island. Japanese author Ogai Mori (森鷗外) used Takasegawa as the background for his novel The Boat on the Takase River (高瀬舟, 1916), a moving story about a constable who transports a man found guilty for murdering his brother on a takasebune to Osaka. After hearing his story, the constable starts to sympathize with him. The tree-lined canal is still there and is very attractive for a nice stroll that reminds you of a Kyoto that vanished when the car took over. You can also licence this image online: 80115-0009 @ MeijiShowa.com. I remember seeing this river on my visit to Kyoto last year. It is much different today. Thanks for bringing this view, I really enjoyed it. I agree, this is a really distinctive spot in Kyoto – a great place to take a walk and relax for a while. I also enjoyed the canal area that you mentinoned. Nice find!